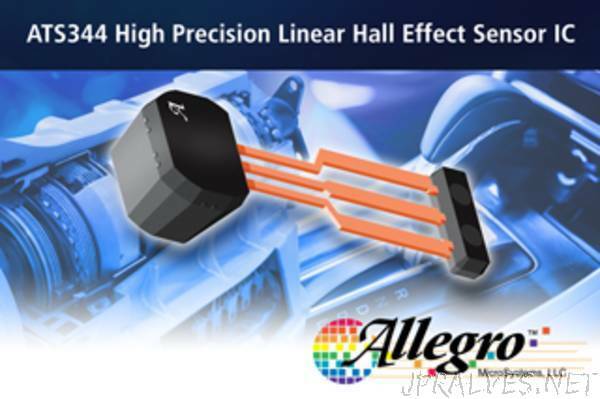 “Allegro MicroSystems, LLC introduces a new high precision, back-biased, programmable Hall-effect sensor IC. Allegro’s ATS344 includes differential Hall elements and is packaged in a custom back-biased package that includes an integrated magnet. This new device incorporates a 2wire current mode PWM output in order to help minimize pin count for remote sensors. It also includes on-chip EEPROM technology, capable of supporting up to 100 read/write cycles, for flexible end-of-line programming of calibration parameters. The ATS344 is ideal for automotive applications requiring high resolution detection of long stroke (>5mm) linear motion.